A virus strikes Albanian public servants each time corruption scandals become public. This is the Know Nothing Virus, for its consequences are the same as its name – the victims know nothing after they get stricken. The last scandal with Bank of Albania – the central bank in the country – proves the point. Earlier this summer, a scandal revolving around the Bank of Albania became public. Apparently, a number of employees of the bank had been stealing money, amounting to approximately the nominal value of 7.1 million dollars. Dozens of employees have been called in for interrogation and a few have been arrested. Yet no one feels responsible or acknowledges responsibility; at least, no one admits to knowing anything. “There was chaos. There was no regulation about the responsibilities of each person. We are still shocked. We don’t know anything,” said Petrit Ramohitaj, Chief of the Active Cash, and Bashkim Xhilaga, former Monitoring Supervisor, after they were arrested. The Director of the Banknote Emitting Department, Dorian Collaku, couldn’t believe that the investigators had the nerve to call him in for a deposition while he was on vacation. His answer: “Let me finish my vacation and then I will come to testify.” And so he did, only to state that he knew nothing. The Governor of the Bank of Albania, Ardian Fullani, is probably the most controversial figure in this scandal. Mr. Fullani met with members of the Parliamentary Commission of Economy to discuss the issue. In a public declaration, he stated that the act itself does not reflect on the vital role of the institution and that the people responsible will face justice. Reasonable observers agree that it would be absurd to expect justice with Mr. Fullani still in charge of the central bank. So far, he has not even stated that he feels morally responsible for the act. There is an American saying that President Harry S Truman made into a sign for his desk: “The buck stops here.” For Mr. Fullani, the buck doesn’t seem to stop anywhere – certainly not on his desk. How do we know that? It is basic accounting. The person in charge of the organization is responsible, in the end, for accounting errors, deliberate or not, made while he is in charge. Any accounting student is taught that, on a trial balance, debits must equal credits – no matter what. Any student is also taught that the person in charge of the business is responsible for any serious accounting problems affecting the business accounts while he is in charge. Perhaps Mr. Fullani skipped those lessons. Mr. Fullani states that Parliament will make sure that a thorough investigation takes place of the Bank of Albania. By Albanian political standard, “a thorough investigation” means a never-ending, non-productive investigation that will end by blaming the poor slob with no connections or influence. And how could any reasonable person expect the investigation to be candid when Mr. Fullani is in charge of almost every committee that would undertake or assist such an investigation? Albania does not have a constitutional privilege against self-incrimination (which Americans know as the Fifth Amendment) if events take an unexpected turn, revealing criminal responsibility on the part of the bank’s management, and Mr. Fullani knows that. The public demands that Mr. Fullani resign, and yet it seems they are powerless. A few protests were organized but they were unsuccessful. In an extraordinary meeting of the Supervisory Council of the Bank of Albania, one of its seven members, Ermelinda Meksi, a former MP, proposed that the council demand the resignation of Mr. Fullani. All the members of the Council voted for the proposition to be put on the agenda. However, the other six members of the Council, including Mr. Fullani as its chairman, rejected the proposition once it was motioned. Nonetheless, even if this Council did require the discharge of Mr. Fullani, the Albanian Parliament would have the last say on the matter by voting on it. But Parliament is out of session this summer, as its members are on vacation, and Mr. Collaku’s answer – Let me finish my vacations and then I shall come – seems to be standard in this case. Erion Brace, MP for the Socialist Party and also chairman of the Parliamentary Commission on the Economy, posted recently on his Facebook page that he thinks that a profound legal, structural and human reform is still needed at the Bank of Albania. Somehow, those who have been watching the Bank of Albania slide into scandal and incompetence already figured out that such a reform is vitally needed. Mr. Brace also stated that there are restrictions on the government’s power to suspend the Governor of the Bank and other members of the Supervisory Council. Reasonable observers might feel entitled to ask what restrictions could prevent the government from dismissing the bank’s management when bank employees had stolen over 7 million dollars without being detected or stopped. If such restrictions do exist, they would make a supervisory post at the Bank of Albania a dream job for many government functionaries and even many legislators. 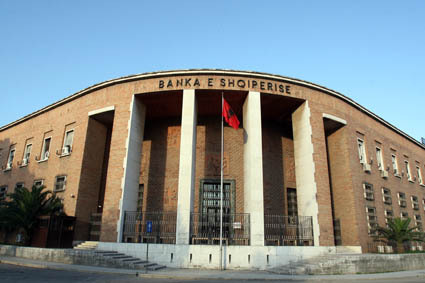 Many critics consider the thefts at the Bank of Albania as a case similar in wrongdoing and scandalous significance to the case of the American company Enron, one of the biggest financial scandals in recent history. In light of such similarities, citizens of Albania started signing a petition to ask members of Parliament to discharge Mr. Fullani. The petition is expected to be signed in the upcoming days and then will be sent to the President. And yet is the President of Albania, Bujar Nishani, the right man to receive this petition? Like the managers of the Bank, he too clearly knows nothing, as he hasn’t made any statement yet about the biggest theft ever made at the Bank of Albania. He too seems to suffer from the Know Nothing Virus, for which there seems to be no cure.